In the recent election for the California assembly seat in the East Bay’s Assembly District 15, many of the millions of dollars spent by and on behalf of centrist Democrat Buffy Wicks came from a constellation of right-wing billionaires with a dangerous agenda. This crew, including Betsy DeVos cronies and heirs to the Walmart fortune, have already bought hundreds of elections across the country, and their goal is to destroy our country’s public schools and replace them with charter schools. These billionaires and their enablers have already made a frightening amount of progress toward wrecking Oakland’s public schools. 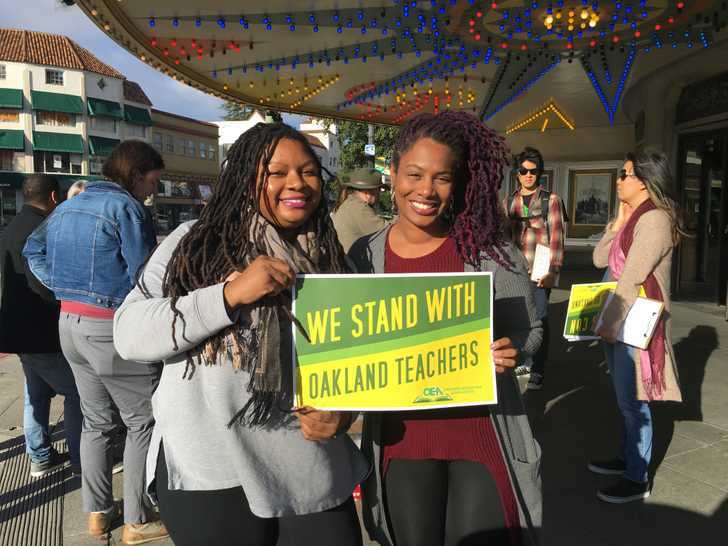 The Oakland teachers’ upcoming contract fight — a fight for students and working people and against corporations and billionaires — may be the last stand in the battle for the soul of public education in the East Bay. The superintendent of the Oakland Unified School District (OUSD) wants to cut teachers’ already dangerously low pay and to replace public schools with more unaccountable charter schools. She claims a budget crisis is forcing this move, but the “crisis” is the result of years of deliberate mismanagement, orchestrated by exactly the same school privatizaters who stand to profit from the superintendent’s plan. This plan would drain even more resources from Oakland public schools, causing a further spiral into chaos for underfunded schools, which would be used to justify more privatization. The Oakland Education Association (OEA), the public school teachers’ union, is demanding that the district fund its public schools and pay the teachers who are their backbone, and to stand up to the privatizers once and for all. Who caused OUSD’s budget woes? What political circumstances have enabled the school privatization movement to flourish in Oakland? And why do billionaires care so much about charter schools? Answering these questions allows us to see what’s really at stake in the OEA contract battle. The teacher retention crisis has a clear cause: as the cost of living in Oakland skyrockets, OUSD teachers remain some of the lowest paid in Alameda County. The starting salary for an OUSD teacher is roughly $46,000/year, far below the $61,000/year and $65,000/year paid to new teachers in nearby Hayward Unified and Fremont Unified, respectively. OUSD’s maximum teacher salary is the second lowest in the county. Unsurprisingly, a survey found that low pay and high cost of living were the primary reasons teachers left the district. Schools are also facing shortages of other critical staff, such as nurses. The shortage is so bad that teachers and other staff often have to take on the role of medical caregivers. After more than a year and a half without a contract, negotiations between OEA and OUSD appear to be going nowhere. The Oakland Post reports that OEA is asking for a 12 percent pay raise over three years, which would bring them into parity with other teachers in Alameda County. They are also asking for smaller class sizes and smaller caseloads for staff, like nurses, who provide critical services to students. OUSD’s most recent offer is a raise of just 5 percent over three years (including a retroactive raise for 2017-18). That’s in effect a pay cut, since it’s not even enough to keep up with inflation. The district also plans to increase class sizes for special ed, making it even harder for high-needs students to get adequate individual attention. OEA teachers are likely to strike if they do not receive better terms. Instead of addressing the moral and material crisis of underfunded schools and educators, OUSD is using a manufactured budget shortfall to argue against increasing teacher pay. The district estimates that, if current revenue and expense trends continue, it will face a shortfall of almost $60 million by the 2020-21 school year. It aims to cut $30 million from the 2019-20 budget, with more than $11 million in cuts to already overburdened school staff. As the district points to deficits to argue against pay raises, OUSD’s superintendent, Kyla Johnson-Trammel, is using the shortfall as a rationale for shutting down public schools and replacing them with charters. The current budget shortfall can be traced back to 2003, when the state of California took control of Oakland schools—with little justification, and at the behest of people with ties to billionaire Eli Broad, one of the biggest funders of school privatization efforts. Broad’s allies included then-mayor Jerry Brown and then-State Superintendent of Public Education Jack O’Connell. O’Connell and Brown placed OUSD under the control of state administrator Randolph Ward, a graduate of the the tycoon’s Broad Academy. The aim of the Broad Academy is to train an army of corporate-minded administrators like Ward and place them at the head of the nation’s largest school districts. The ultimate goal, of course, is imposing school privatization across the country. Ward pursued Broad’s agenda with zeal, shutting down 14 traditional public schools and opening 13 charter schools. Two of the state administrators that followed Ward were also Broad Academy grads. By the time the state relinquished control of OUSD in 2009, the number of charters in the district had more than doubled. The expansion of charters has had a crippling impact on district budgets, since each new charter enrollment drains the resources allocated per student to traditional public schools. This resource loss ruins the economies of scale that public schools rely on to educate students affordably. OUSD’s last superintendent, Antwan Wilson, also bears a large share of responsibility for the district’s financial woes. According to the Washington Post, Wilson ran up the deficit by blowing money on administrators and outside consultants before abruptly resigning in late 2016. Wilson is a fierce charter school proponent who advocates for the application of corporate management practices to public schools. Wilson, like Ward, is a graduate of the Broad Academy. Broad and his ilk want nothing less than the complete dismantling of public education in the United States. In 2015, the Los Angeles Times reported on a plan released by Broad’s foundation to have 50% of LA students in charter schools by 2023. The plan cited listed Michael Bloomberg, Tesla CEO Elon Musk, and the foundation of fellow billionaire school privatizer Bill Gates as potential donors to this project. A similar covert plan to charterize Oakland has long been an “open secret,” according to UC Berkeley education policy professor Bruce Fuller. Over a quarter of Oakland students are now in charter schools. That’s the highest rate of charter enrollment in the state. GO Public Schools is a key player in the effort to tip Oakland toward complete privatization. GO is a non-profit that has poured hundreds of thousands of dollars into electing pro-charter candidates to the Oakland school board. GO pushes school privatization in Oakland by “astroturfing”: creating organizations which advance a corporate agenda while presenting themselves as grassroots community groups. The organization is another project of billionaires, including Michael Bloomberg (again), T. Gary Rogers—the late CEO of Dreyer’s Ice Cream—as well as Silicon Valley tycoon Arthur Rock. Independently of GO, Bill Gates and Walmart heirs Carrie and Greg Walton-Penner have spent big on pro-charter candidates and groups in Oakland. The Waltons even funded a charter school in East Oakland that failed within a year, disrupting education for hundreds of students and costing OUSD several hundred thousand dollars, according to the East Bay Express. GO-funded candidates dominate the Oakland school board. Given that fact, it’s tempting to speculate about why, exactly, the school board let then-superintendent Wilson wreck the district’s budget. Were they deceived? Negligent? Or did they consciously decide to look the other way while their corporate-trained superintendent set the district up for an aggressive privatization push? What is clear is that the current superintendent’s proposal to shutter public schools and shift to charters would be a disaster for the city. School closures are most likely to happen in low-income communities and communities of color; these closures are disruptive to students and their communities. Even worse is the proposal to rely more heavily on charters. Advocates of charter schools present them as more efficient, innovative alternatives to traditional public schools. Pro-charter groups claim that traditional public schools have failed the most disadvantaged communities, and that corporate-run schools are the solution. All of this is pure fantasy. Studies have shown that charters perform no better on average than public schools, and often fare worse. What does predict school performance is how wealthy a school district is. Schools in districts with high average incomes generally perform better, and those in districts with low incomes perform worse. This is no surprise, given that public schools receive a large portion of their funding from local property taxes. If we want to address failing schools, we need to redistribute wealth to tackle poverty and address gross inequities in school funding. Although charter schools don’t improve student outcomes, they have all sorts of destructive impacts. As noted above, they massively drain resources from public schools. In the 2016-17 school year alone, OUSD lost $57 million in revenue to charter schools. Charters are a particularly severe drain on resources for special needs students. Oakland charters receive 28 percent of special education funding, but only enroll 19 percent of special education students, and an even lower percentage of the highest-need students. Indeed, charter schools are notorious for refusing to accept special needs students. The result is that special ed students disproportionately attend public schools, which are left increasingly ill-equipped to serve them. Introducing a substantial number of charters into a district creates an insidious political dynamic. Public schools struggle financially because they lose resources and money to charter schools; charter advocates then argue that the solution is further privatization. This is exactly the dynamic we see playing out now in Oakland. Billionaires are dedicated to building more charter schools, not because they help students, but because they generate corporate profits. Charter corporations use taxpayer money to engage in lucrative real estate deals. But these companies are not democratically accountable to the public, and they are exempt from many of the regulations public schools face. (For instance, they are not required to go through a competitive bidding process for contractors.) The lack of accountability and transparency has allowed charter chains to engage in widespread fraud and abuse. The charter school movement is also an assault on teachers’ unions, one of the last bastions of organized labor in the US. Charters are usually nonunion, allowing them to impose more work for lower pay and fewer benefits on teachers. The wealthy have a strong material interest in paying teachers less, since that means lower taxes; they also have an interest in a weaker labor movement generally. It’s no coincidence, then, that attacks on unions are central to pro-charter propaganda. Control of students is important as well. As Arlene Inouye of United Teachers of Los Angeles told Jacobin magazine, “Corporate interests… don’t want young people these days to have critical thinking skills and to challenge authority.” To that end, many charters institute extreme disciplinary regimes on students and tailor curricula to the narrow purpose of getting students to do well on standardized tests. If and when OEA goes on strike for a better contract, they won’t just be fighting OUSD. They will be fighting the ultra-rich elites who bought out the school board, pushed the district to the financial brink, and now want to use the crisis they created to attack teachers’ unions and privatize Oakland schools. The teachers’ demands for better pay and adequate staffing represent resistance to the privatization movement. East Bay DSA stands in solidarity with Oakland’s teachers, students, and parents in their fight to preserve public education. In doing so, we take part in another front in the class struggle that defined the AD15 race. Many of the privatizers mentioned above—Eli Broad, Michael Bloomberg, the Walton-Penners—funded Buffy’s campaign, because they knew they could count on her to advance their agenda. Now, as then, we fight with working people to protect democratically controlled, public goods from the corporations and billionaires who would destroy them.